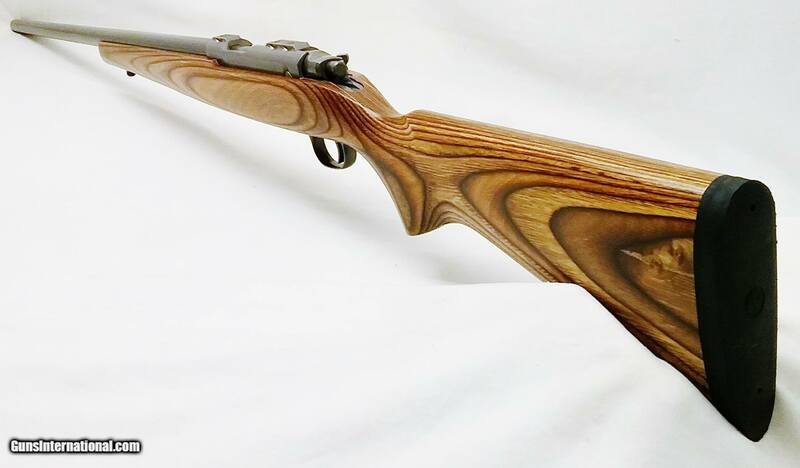 This 22LR Ruger All-Weather Model 77/22 bolt action rifle has a 24” tapered round 7/8” to 5/8” Target Grey barrel with recessed target crown and integral scope mounts. The bore is very good. The Wood Laminate stock with Ruger recoil pad and pistol grip, and forend are attached to the Target Grey bolt action. This rifle is in Like – New condition. Comes with 10-round rotary magazine, sling swivel studs, scope rings and box. The length of pull is 13-3/4”, overall length is 43-1/2”, weight is 7.4 lbs. Our stock number is A773. Will ship to any FFL anywhere in the United States. Buyer pays freight and insurance.